How Do You Eat THAT Vegetable? Butternut Squash. Vegetable Series: When we changed our eating two years ago, I resolved to be afraid of no vegetable. Not knowing how to cut it or cook it was NOT going to keep it out of my cart. For a long time I’ve wanted to do a series of posts on all the different vegetables we have tried and what we do to the poor things. May you, too, vow to try any and all vegetables in your supermarket! Go get ’em, tiger. Okay. We’re back on the vegetable trail. Have you tried rutabaga yet? Artichoke? Kohlrabi? Jicama? If not, you ARE missing out! Today’s featured vegetable, butternut squash, should be one of your favorites. Why? 2. Sweet potato . . . sweet potato . . . where are you? Drat. I’m out of sweet potatoes. Where’s a pumpkin? I’ll substitute with pumpkin. Pump-kin . 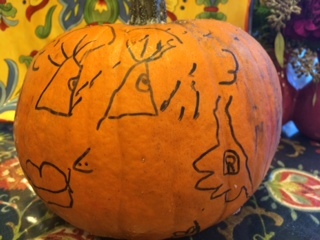 . . pump-kin . . . where are you? Oh. No pumpkin either, canned or otherwise. Well, shoot. What’s left to substitute? I AM making this recipe today. . .
Aha! Butternut squash. Butternut squash can often be substituted for pumpkin and sweet potato in pies, casseroles, and soups. Great for poor planners. (No. That’s self-deprecating. Let’s practice re-phrasing and positivity to help reduce stress levels which lead to chronic disease.) Great for busy moms who prefer to spend time with their kids–rather than shop with them. We eat a lot of hard squashes in our house, particularly butternut and pumpkin, but here is a no-frills recipe which is simple and gets the following remark: “What is this? Sweet potato? 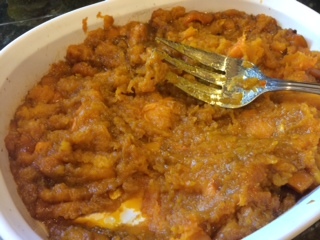 Tastes like sweet potato casserole.” The hardest part of working with hard, winter squashes is cutting them. Get out your biggest butcher knife to cut that thing in half! Then, lay a half on its flat surface and start cutting it into half-rings. Cut the half-rings into wedges–like you would a pineapple! Use a smaller knife to then slice off the peel left on one side of the wedge. 1. Preheat oven to 350 degrees Fahrenheit (177 degrees Celsius). 2. Cut your squash if you haven’t already. 4. 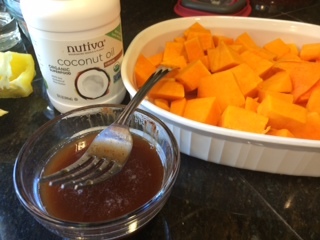 In a smallish to medium-sized bowl, whisk together maple syrup, melted oil, and spices. Pour over squash and give a quick stir to coat squash. 5. Bake for about 45 minutes to an hour. (Baking time will vary based on your oven and on sizes of the squash pieces.) Squash is finished baking when it is fork tender. 6. You are not done! Use a large fork or a hand-masher gadget to squish up the squash. Then, give it a few good stirs. 7. Transfer to a pretty serving dish and serve warm. Family “gustar” report: 6/7 eaters liked this. (We have company staying with us.) My youngest eater took her mandatory bite. She used to be my best eater, but she is going through a picky time. I also served this at a large family get-together, and it was well-received by my mom, dad, and sisters, a fussy, honest crowd. You can see below the casserole dish I chose, the “wedges” of squash I described, and squashing it up (and why I suggest putting it in another serving dish). Do you eat squash? Which is your favorite? How do you fix it? Photo credit: Wikipedia, public domain photo. 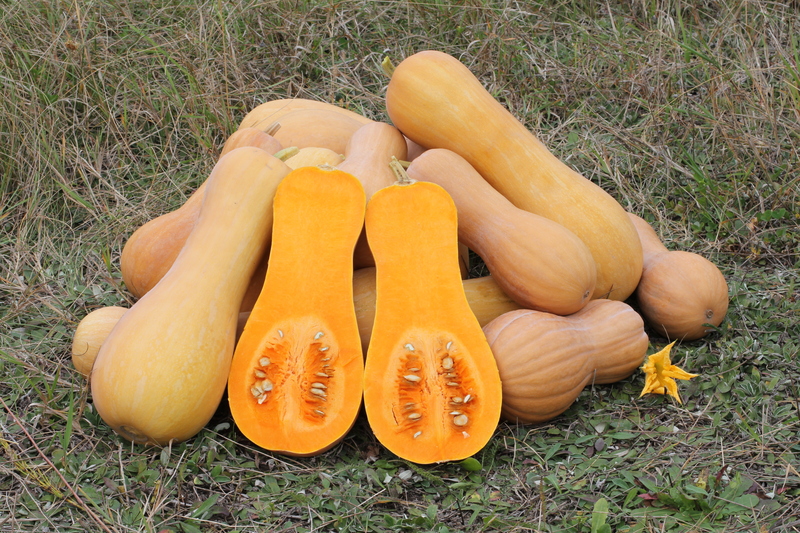 Butternut squash, cultivar variety of Cucurbita moschata, ripe fruits. Ukraine. Photographer, George Chernilevsky. 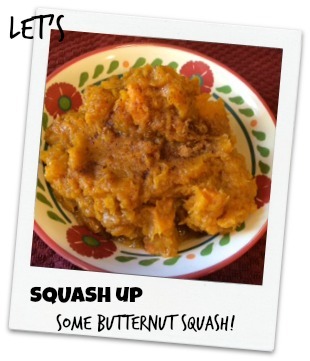 This entry was posted in Recipes and tagged easy way to make butternut squash, eat more vegetables, how to cut a butternut squash, what to do with butternut squash on November 11, 2014 by thehomeschoolingdoctor.